So this was not the first time I used the Perfect Spoon from DavidsTea. I may have several (and a few that didn’t make it into the photo). 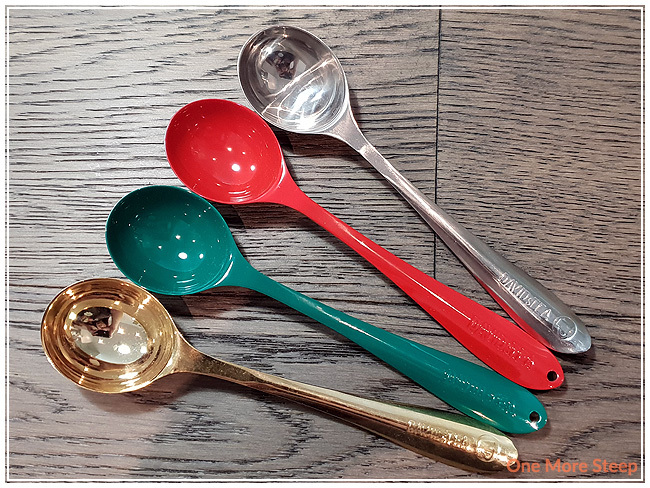 The spoons themselves are stainless steel – they frequently release coloured ones that are either sold by themselves or as part of a set. I got the red and green ones from the past winter collections as part of sets. I typically only use the silver one because it was my first Perfect Spoon. 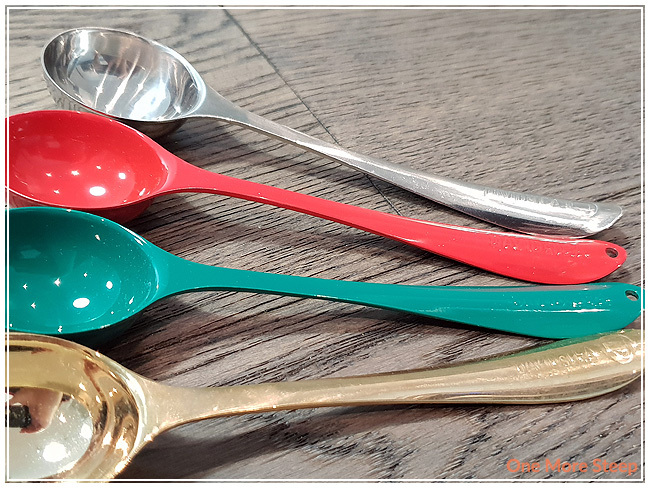 The coating on the coloured spoons are not durable or dishwasher-friendly. I’ve seen many complaints online of the coloured spoons getting damaged and the coating flaking off. I think this is part of the reason why I don’t use the coloured spoons. For reference, the price of the silver/plain Perfect Spoon is the same as the coloured Perfect Spoons (at the time of writing). There’s been limited edition spoons that have been more expensive in the past and some of them come in boxed packaging (e.g. rose gold). A Perfect Spoon is 2½ teaspoons. I hand wash all of my Perfect Spoons after use, and I store them in a cup. Since I only use them for tea, I generally just rinse in warm water and use dish soap when I use it to scoop an ‘oily’ tea (e.g. Earl Grey, some herbal/fruit infusions). The Perfect Spoon performs its job well. It’s a spoon, it scoops! That said, not all teas should be measured out by how many spoonfuls. 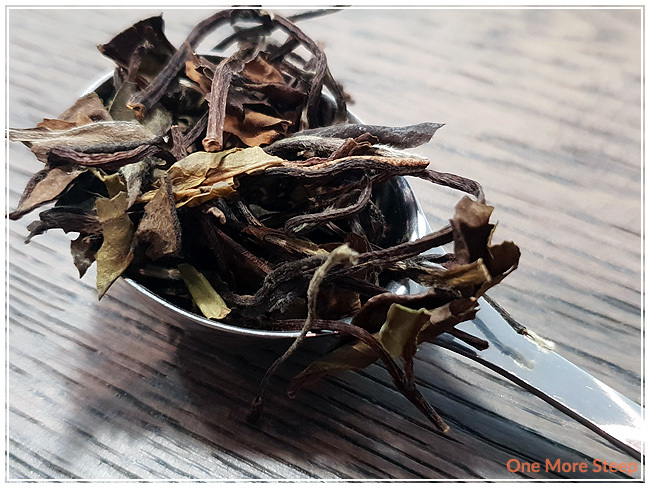 As you can see in the photo, an airy tea like Sau-Mei will have a lot of ’empty’ space between the leaves – which is why I do a heaping spoonful. For teas that are denser or have larger pieces (e.g. teas with dried fruit pieces, a rolled tea like Jasmine Pearls) will need more or less tea. Fancier tea connoisseurs than I am will use digital food/kitchen scales to measure out their tea instead of spoons. Since I’m not that fancy yet, I typically use my Perfect Spoon and just eye-ball it. I loved DavidsTea’s Perfect Spoon. 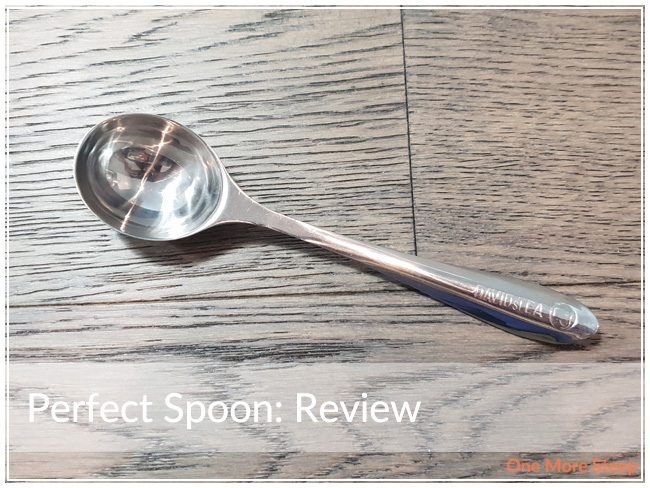 I’ve used it pretty much consistently since I’ve gotten it – with zero issues from the silver Perfect Spoon. I’m too leery about having the coloured coating come off in my tea, which is why I opt to not use them. I mostly just have the coloured ones because they came in gift sets that I had bought (for myself). That said, it isn’t the cheapest of spoons. If you already have a teaspoon-sized measuring spoon in your kitchen, you might not want to get it because who needs another spoon that isn’t a standard unit of measurement? I’ve gotten all of my Perfect Spoons as part of promotional sales or as part of a boxed gift set, so I haven’t purchased a Perfect Spoon by itself just yet (pro-tip if you’re wanting one but don’t want to spend $7 on a spoon…).